Social Media Enthusiasts - become a Yahoo Insider and fly to New York! Social Media Enthusiasts – become a Yahoo Insider and fly to New York! Yahoo! is organizing a contest of sorts and looking for a handful of social media enthusiasts to fly to New York. Billed as the Yahoo! Insider contest, Yahoo will select some Insiders who will then get an opportunity to fly to New York with a friend, all expenses paid, to learn the ins-and-outs of exclusive Yahoo! content. Also on cards will be an exclusive filming of Yahoo!’s newest original program, Trending Now. For six weeks starting August 29, Yahoo! 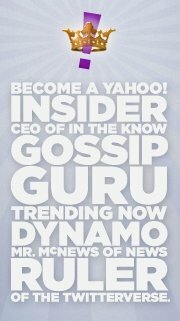 Insiders will spread exclusive Yahoo! trending content to their own social networks through Facebook posts, blogs, Tweets, etc. Every Insider will be scored along the way to win amazing prizes, but only one will go home with $5,000 and a MacBook Air. Interested? Head over to the Yahoo! Search Facebook page before July 31st.